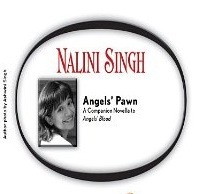 Angel's Pawn by Nalini Singh is an e-book and a novella, so it's not too long and a fast read. It's actually called a "companion book" to Angel's Blood. As a companion book, I think it works well. 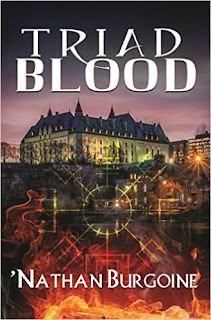 The story works by giving the reader the starting blocks to the Hunters Guild world without giving away too many details -- the ones Singh really gets into in Angel's Blood. I read Angel's Blood first, so I was already familiar with its main character. The two main characters are Ashblade or Ashwini, a Guilt Hunter, and Janvier or The Cajun, a Vampire, as he is referred to in most of the book. These two characters share a history and some serious chemistry. However, there's not a "conclusion" to their relationship in this novella. My hope is that their will continue to be developed throughout the series because I really loved both of these characters, and unlike Elena -- whom I really liked, but took me a while to embrace -- I liked Ashwini from page one. There's a lot we still need to learn about this character and I'm very curious about her. Janvier is too charming for words and I'm definitely rooting for him. You'll also meet a mid-level angel in this novella, Nazrach, who rules the Atlanta territory and who's having problems with two different factions of Vampires trying to take control from each other. An old family that has been ruling for centuries and a new, ambitious Vampire who wants to take over. Although the Vampires have autonomy when it comes to their own businesses, etc... they have to ensure that they don't ultimately challenge the Angel who rules them in any way. The conflict here involves all factions -- Nazrach, the Angel, the Beaumonts, an old Vampire family and Callan, a new and ambitious Vampire trying to take over. Ashwini and Janvier come in to help resolve the problem and in the process make more enemies than friends. They also learn to see each other in a whole new light and gain an appreciation for each other that they didn't have before. I read this prequel second and Angel's Blood first, so I was already familiar with the worldbuilding. I wonder how it would be to read this novella first? Either way, it's a good one and I personally loved it! I think this is a story that Ms Singh might continue in novella or one day, Ash and Janvier will have their own book :P By the way, they were mentioned in Archangel's Consort, but very shortly. This reminds me that I never read this novella! I totally forgot about it. Gah. I have to read this too. I'm still debating on rereading Angels' Blood. I have Archangel's Kiss on the TBR but kind of think I might want to get back into the world with a reread of AB. .. anyone wanna tell me what to do? Christine, this is a nice short read, but a good one. I know what you mean... I'm preparing to read Archangel's Kiss too. I skimmed Angel's Blood and read my notes on that book (yes, I took notes, lol) and have decided to re-read this story to refresh my memory about the world, characters and overall story. It has been too long and I needed that refresher course. LOL!